After finally escaping Surfers Paradise, we spent two nights in Brisbane where we met up with our friend Laura from the Coogee Crew (Sydney Dec 15th - Jan 10th). It was great to see her & compare stories of our adventures & we had some fun nights out & even managed to fit in a few hours of sight-seeing where we took the City-Cat ferry round the city & stopped off at Brisbane's man-made beach. After Brisbane was a 2 night stop in Noosa Heads, which is a beautiul, quiet little beach town. Noosa is the last stop up the East Coast where you can surf so we decided to treat ourselves to a surf lesson. Maybe describing it as a 'treat' was a little optimistic, it is unbelievably hard & I felt like I was being punished for something. After 3 hours, I still hadn't made it to standing & I was black & blue so I decided to call it a day. Don't get me wrong, it was good fun but I'm obviously not a natural! While in Noosa, we also visited the National Park & did a coastal walk which was absolutely breathtaking, sadly we didn't see any dolphins though! We left Noosa for Hervey Bay, where we had 2 free nights accommodation included in the package we'd booked for our Fraser Island 4x4 beach safari. We were so excited to finally be getting to the adventure tour stage & we'd heard the most fantastic stories about it. We'd been strongly advised to 'network' & make some friends as soon as we arrived in Hervey, as the groups for Fraser are up to 11 people & you ideally want to go with people that you know you like & will have a laugh with. Only problem was, when we arrived, our hostel was deserted! The tour groups for Fraser leave daily & evidently the thursday tour had pretty much emptied the hostel. So on the Friday, we made sure that we were milling around during check-in time, with a hope of accosting some people before we went to the welcome meeting for our tour which was starting the next day. While we were subtly trying to size up people to go & speak to, 3 Scottish lads (Paul, Ross & James from Glasgow) ambled over & we started speaking to them. Luckily they were starting Fraser the next day too & we hit it off with them straight away. At the welcome meeting, the groups were formed & although we originally only had one of the Scottish boys put in our group, we managed to do a bit of people swapping & Group B ended up being the 3 Chicks, the Scottish lads, Matthew & Caroline from Switzerland, Lauren & Clare from Bath & Karine (our crazy French/Canadian friend from Byron). During the briefing, only 4 out of the 11 of us volunteered to drive the 4x4 - me, Jill, James & Ross so we knew that we'd each have a fair share of driving to do to get us round Fraser - which is the world's largest sand island. After the meeting, we headed en masse to the local supermarket armed with our shopping list for 3 days worth of camping. Me being the only veggie (surprise surprise) settled myself in for 3 days worth of veggie burgers & crisp sandwiches! We woke bright & early for our 2nd briefing at 6.45am. Here we were given maps, itineraries & instructions for drivers who hadn't driven 4-wheel drive on soft sand before. Then we were given all of our camping equipment & shown how to pack the 4x4's to get maximum space out of them. By 10am, we were ready to set off, so I volunteered to drive first figuring it might be safer to practice driving the thing on land before sand! It was actually really easy to drive & we all made it to the port where we were catching our barge over to Fraser in one piece. A slight hairy moment was when I had to reverse the bloody thing onto the barge without any safety barriers either side but again, I made it. The barge only took 30 minutes so before we knew it, we were on Fraser. I even remembered to pull over so James (the group's designated mechanic) could let the tyre pressure down as instructed & more importantly, I remembered to shift to 4 wheel drive, or else we would have been going nowhere fast! That first afternoon, we drove to the smaller lakes & checked out the Happy Valley, it was all absolutely stunning & unlike anywhere I've ever been. Manouvering the huge 4x4, complete with 10 passengers along the extremely uneven & bumpy sand trails was a bit of a challenge but good fun. After stopping for a quick crisp sandwich lunch, we carried on the trail & finally, we hit beach! It took a while to get used to driving along an endless stretch of beach with the ocean lapping at your tyres but what an experience! By the time we'd stopped to play frisbee & then visited the famous shipwreck, it was nearly dark (when driving is strictly forbidden ) so we decided to pitch up camp. I volunteered to cook the dinner leaving the lads to pitch the tents. Cooking for 11 on 2 tiny gas stoves is easier said than done but we got there eventually & everyone tucked into burgers & sausages. We also decided that as we weren't driving again that night, we'd hit the goon (cheap cask wine) even though it was still early. Asking for trouble - by 7.30pm, every one of us was steaming! It was good fun though, we all sat talking & drinking on the beach under the stars & were joined by people from the other groups camped further down. One by one, people from our group starting hitting the sack as the goon took full effect & by 2am, me & James were the last ones standing. We walked along the beach & paddled in the water, before the wild dingoes came & scared the life out of us! We were woken at 8am by Ross screaming 'get to the chopper', meaning it had started to rain & so we'd better pack up the tents. After a delightful breakfast of coffee with sand in it & burnt, fried toast, we packed up & got on the move again, via a nearby campsite for quick showers. We had quite a packed itinerary for that day but as we got going the rain started coming down even harder. First stop was the lookout over Indian Heads where you can see stingrays & sometimes whales. Unfortunately though, in torrential rain it was hard to see much of anything but we could all appreciate how beautiful it was. Next on the agenda was the champagne pools which were a long walk away, so we decided to skip them - not much point if you can't swim in them & none of us wanted to do that in the rain! We drove some more, stopping off at Eli Creek & Lake Wabby which were also beautiful spots but by 3pm, we were all starving & soaked through so we pitched up camp for the 2nd night & cooked up some lunch. We spent the afternoon playing frisbee, football & wheelbarrow races on the beach & when the heavens opened yet again, we all bundled into the 4x4 for an afternoon/evening of drinking games with goon. It was so much fun, very drunken & we all knew that it just wouldn't have been the same if we hadn't had such a fantastic group. Ross even donned his kilt for us! The rain didn't stop the whole night & by the time people were ready to go to sleep, a couple of the tents had flooded. In the end, 7 people spent an extremely uncomfortable night in the van, while the other 4 braved the cold & wet out in the tents. After sleeping very little, we all rose at 5.30am & packed up quick as we had to be on the move by 6.30am to avoid the high-tide. Luckily the rain was easing off by this point & we could see a clear sky in the distance. We drove to Lake Wabby first & finally, just as the sun was coming out, we arrived at the infamous Lake Makenzie- by far the highlight of the trip. It is absolutely breathtaking, the sand is pure white & the ocean a rainbow of blues & greens. With the sun out it was also fairly warm so we all took a dip & posed for the classic group photos in the lake. We spent a very happy few hours there, sunbathing, swimming & appreciating how stunning it was before it was time to start making our way back to the barge that would return us to Hervey Bay. We arrived back tired but happy & after a group wash-up of the camping equipment etc, our vehicle was checked over (all good I'm pleased to report) & our deposits were returned to us. We all gratefully had a proper, warm shower before meeting up again for a Group B farewell dinner to use up some of our leftover food. The 3 Chicks & Matthew & Caroline were leaving Hervey that night on the Greyhound overnight bus to Airlie Beach so we knew it was the last time we'd see some of the group. We all agreed that despite the weather, it had been one of the best experiences of our travels & that we were lucky to have ended up in such a fun group together. I personally loved every second of the trip & will never forget it. 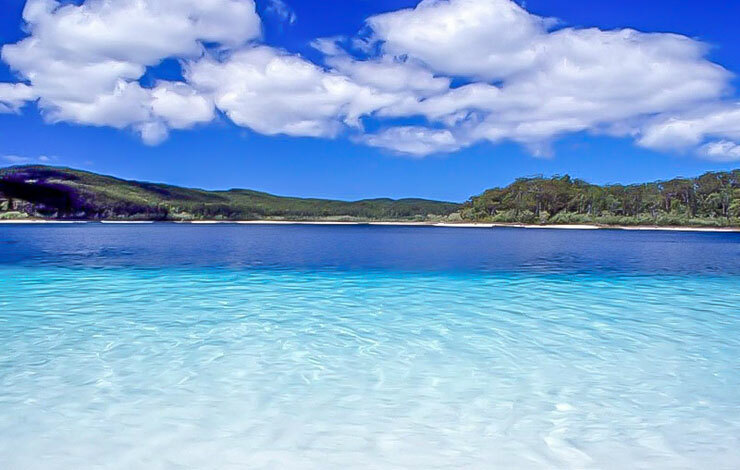 To anyone planning to travel Oz, I'd say a Fraser Island beach safari cannot be missed!